Three major lines of evidence point to the glaciers' eventual demise: the changes in their flow speeds, how much of each glacier floats on seawater, and the slope of the terrain they are flowing over and its depth below sea level. In a paper in April, Rignot's research group discussed the steadily increasing flow speeds of these glaciers over the past 40 years. This new study examines the other two lines of evidence. The team used radar observations captured between 1992 and 2011 by the European Earth Remote Sensing (ERS-1 and -2) satellites to map the grounding lines' retreat inland. The satellites use a technique called radar interferometry, which enables scientists to measure very precisely — within less than a quarter of an inch — how much Earth's surface is moving. Glaciers move horizontally as they flow downstream, but their floating portions also rise and fall vertically with changes in the tides. Rignot and his team mapped how far inland these vertical motions extend to locate the grounding lines. Slowing or stopping these changes requires pinning points — bumps or hills rising from the glacier bed that snag the ice from underneath. 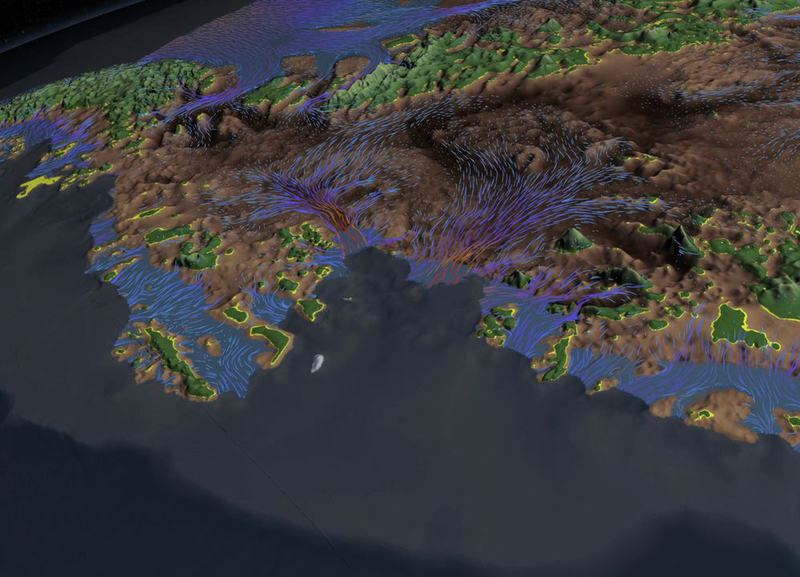 To locate these points, researchers produced a more accurate map of bed elevation that combines ice velocity data from ERS-1 and -2 and ice thickness data from NASA's Operation IceBridge mission and other airborne campaigns. The results confirm no pinning points are present upstream of the present grounding lines in five of the six glaciers. Only Haynes Glacier has major bedrock obstructions upstream, but it drains a small sector and is retreating as rapidly as the other glaciers. Because of the importance of this part of West Antarctica, NASA's Operation IceBridge will continue to monitor its evolution closely during this year's Antarctica deployment, which begins in October. IceBridge uses a specialized fleet of research aircraft carrying the most sophisticated suite of science instruments ever assembled to characterize changes in thickness of glaciers, ice sheets and sea ice. Find additional images and video related to this new finding. Learn more about the West Antarctic Ice Sheet and its potential contribution to sea level rise. Learn more about Operation IceBridge. Learn more about NASA's Earth science activities in 2014.